If you look at this year's movie line up, it's a year for fairy tales. "A Royal Elf of Abalon" is no exception. I felt liked I'd wandered into a fairy tale when I picked up the book. The story started off with secret meetings and references to a wicked queen. When I first started reading the book, I could see from both the title and the details included at the beginning of the book where the story was headed, and I was intrigued about how all the pieces would fit together. I confess to having stayed up very late to finish the book. Like all good fairy tales, there's a happily-ever-after ending, but I ached for the characters as they went through their trials to get there. It's a story I enjoyed and its also one I feel comfortable handing to my children. The romance and action will interest both the young audience and an older one. Highly recommended. From the moment I had the chance to meet Author Anna del C. Dye I have been intrigued with her stories. I'm not usually one who enjoys elves and fantasy, but when asked to review A Royal Elf of Abalon I didn't hesitate, and I'm glad I didn't. A Royal Elf of Abalon follows a young princess, Amaria. Raised by a cruel and jealous queen, Amaria leads a sheltered life, but when enemies attack the kingdom, Amaria is sent away. Soon, the young princess discovers all is not right in her kingdom. Her mother's cruelty goes beyond anything Amaria believed, and after she meet Kurzan, an elf who has come to the kingdom's rescue, the story really takes off. The author does a fantastic job keeping readers engaged. The plot twists and turns, and Dye has developed strong, unique characters that will leave a lasting impression.This story is filled with high adventure, intrigue, and a secret, forbidden love. If you loved Lord of The Rings, Dye's books are sure to keep you reading late into the night. This book was reviewed by Lee Ashford for Readers' Favorite. "A Royal Elf of Abalon" by Anna del C. Dye is almost certainly the finest Fantasy it has ever been my pleasure to read. The human Kingdom of Abalon was ruled by the wicked and evil Queen Amathis. In her efforts to produce an heir to the throne, she wed and subsequently killed 8 husbands. Shortly after disposing of her eighth husband, she produced a girl, Amaria. A few days journey from Abalon was the elfin town, Lothia, but humans disliked and distrusted elves, and consequently had little contact with them. However, when the elves discovered an Orc army marching to attack Abalon, they knew their own town would be next, so they recalled their army from outlying areas and marched to the aid of Abalon. Arriving on the scene just as the Orcs had broken down the city gates, the elves attacked from behind and soon had routed the Orcs and saved Abalon. But would this change the humans' bias against elves? Would Queen Amathis magnanimously honor them for their timely intervention?I have read a number of Fantasies, and one thing has always puzzled me: why do the authors always seem compelled to assign unpronounceable names to their characters, such as Cwwndyd or Xxsthal or Oquirrh? I find this very distracting; each time I encounter such a name my brain pauses for a moment as it stumbles over a word it cannot comprehend. In "A Royal Elf of Abalon", the author not only used "real" sounding names which were easily pronounced, but she even provided a table in the very front of the book, indicating how each name was to be pronounced (just in case) and identifying who or what that name belonged to. I was immediately quite impressed with her... long before I learned she is already "an accomplished, multi-award winning author". This book was a pleasure to read. The characters were so well developed I felt I would recognize them if I saw them on the street. I very strongly recommend this book for Fantasy fans everywhere. It was an honor for me to review it. "A Royal Elf of Abalon" will be a tough act to follow for any Fantasy story I subsequently may review. This was a clean, delightful story for the whole family to enjoy also a good Book Club story for discussion.Elf land was a utopia that I, for one, would love to live in and believe we will in future years ahead.There is much we can relate to in both the world of Abalon and the surrounding kingdoms.The ending seemed to abrupt without enough conflict that exists in the 'real' world. However, that is my opinion and still feel it was a great story with conflict, support of allies, differences in cultures, cruelty of others, and also Utopian life we can strive to find and live.I won this e-book but would have eagerly purchased it anyway. I found "A Royal Elf of Abalon" to be an intriguing read. It's a true fairy tale/fantasy - a story of princess, Amaria who watches her life evolve from an oppressed daughter of a cruel and possessive Queen to a life of a courageous and wise leader of her people. Discovering the extent of her mother's evil, Amaria finds comfort in the love of a young elf man, Kurzan, whom she knew she could never marry. This story takes the reader on an amazing journey as they read this book written by Anna del C. Dye. Fantasy, with a bit of fairytale best describes this easy, enjoyable story of love and betrayal.Read full review in the 2012 May/June issue of InD’tale Magazine. Very fun fantasy read. I loved it. Anna del C. Dye - Anna del C. Dye was born in Valparaiso, Chile, amongst some of the world’s most famous beaches. After meeting Rodney, a native of Idaho, in her hometown, two years later, Anna traveled to Utah on Christmas Eve and married him two weeks later. Their love story, Why Him? was published by Covenant in the book entitled Angel round about. Anna and Rodney reside in Taylorsville, Utah and are the parents of three princes and a princess. They love to camp, canoe, explore ruins and have sword fights.Anna del C. Dye is an accomplished, multi-award winning author. Her short story “Amerine—Fairy Princess” won 2nd place in the Oquirrh Writers contest. The first book in her new YA Romance Series entitled “A Kingdom By The Sea” won 2nd place in The Absolutely Write contest. Book three of “The Silent Warrior Trilogy,” won a bronze seal in the League of Utah Writers. Shahira and the Flying Elfs won Honor in the Oquirrh first chapter contest. Emerine’s Nightmare, a pre-teens short story, won 1st place right before it was released in digital formats for the Kindle and Nook.Anna’s works include “The Silent Warrior Trilogy,” the beginning saga of her young adult elf series. Book one, “The Elf and the Princess” book two, “Trouble in the Elf City” and book three, “Elfs in a Conquered Realm.” Her stand alone books: “Curse of the Elfs,” “A Royal Elf of Abalon”, “Shahira and the Flying Elfs” and the "Roilden Stone of Elf Mountain". 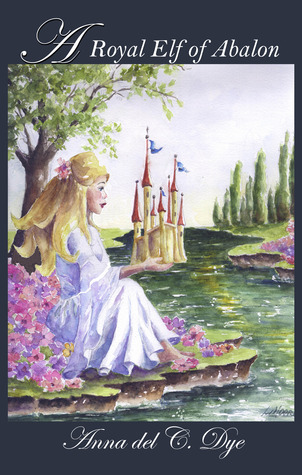 Also her children’s book “Emerine’s nightmare” Her second Series called the Royal Romance started with her book "Once Upon Two Kingdoms" and now Kingdom by he Sea.